Pregnancy is meant to be a time of joyful anticipation. As due date approaches, the “I wonder when” is thought often and with a little smile. Butterflies start to flutter in the very round, full tummies of women around the world as they eagerly await the arrival of their little bundle of joy. I am certainly waiting. But not for the arrival of a little person. Or the feeling of those first contractions. I am waiting to feel a warm gush. To see an unwanted red stain. To have that wave of panic set in again. This is what it feels like to have placenta previa. 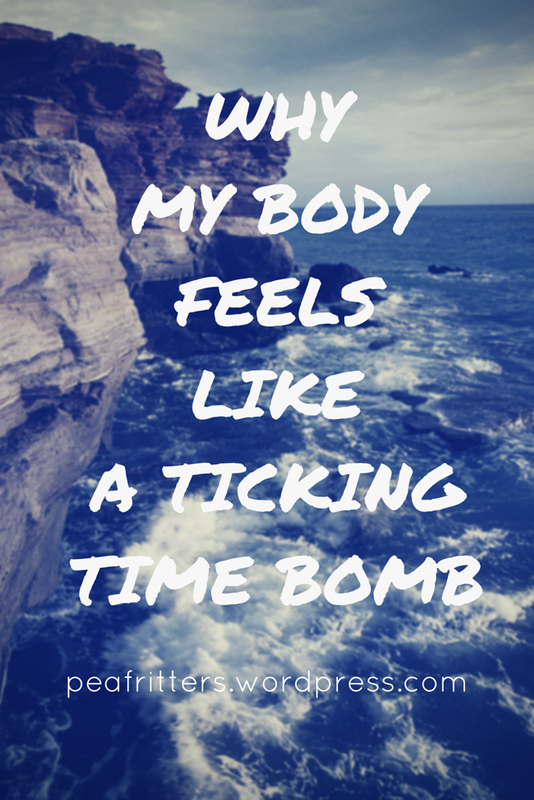 You feel like a ticking time bomb. You wait and wait, for that bleed you’ve been told is likely. You wonder when it might happen. You wonder how big is it going to be. You wonder if it will be the catalyst to you ending up in hospital for weeks. Or maybe it will be the moment your baby is brought into the world, weeks too soon. Will you be alone when it happens? Will you be doing the grocery shopping? Will you be at work? Will it be the rude awakening from a good night’s sleep? I am currently 32 weeks pregnant. 2 weeks ago at 11pm, as I lay in bed, I felt that warm gush. A familiar feeling to any woman over the age of 13. It’s a feeling you’re not meant to have when you’re pregnant. I jumped out of bed, pulled down my pyjama pants to find a large blood stain on my underwear and through to my pyjama pants. Panic set in. Legoman was away in the bush, out of phone reception. I was home alone with our 2 year old toddler. She was sound asleep in her room. I called my best friend (who thankfully and wonderfully lives one block away), who was already awake with her 10 month old. She was on her way. I broke down on the phone and she straight away came to my house. I tried calling my midwife, no answer. I tried calling the hospital, an answering machine. I tried my husband in desperation, voicemail. My midwife called me back just as my best friend opened my front door. She held me as I attempted to pack a bag. My amazing midwife was on her way to pick me up. I was shaking so much at this point. Still feeling the bleeding, not knowing what would happen next. I kept thinking that my daughter would wake up and I won’t be there. Neither will her daddy. It was the first night I had ever had away from her. Not the circumstances that milestone should happen in. At hospital they cannulated me, told me I couldn’t eat or drink and gave me the first dose of steroids, in case my baby needed to be delivered. In case my baby needed to be delivered. That was not what I wanted to hear. My husband wasn’t there. This couldn’t be happening. An ambulance took me to a bigger hospital where I was taken into Delivery Suite. All this time, my wonderful little baby was wriggling around and doing amazingly well. This helped me to stay calm and focused. An ultrasound at 3:30am confirmed that baby was fine and the bleeding had also slowed right down. Everyone started to relax. I could eat again. I could attempt to sleep. 5:30am came and I was woken up by the woman in the room next to me going through the final throws of labour. A few loud screams of “GET IT OUT OF ME!! !” had me giggling in bed, knowing how very close she was to meeting her little person. 10 minutes later the cries of a new life welcomed a quite calm. Life goes on. 6am saw me calling my parents to firstly tell them (but hopefully not alarm them) that I was in hospital. I also needed them 1.5 hours drive away at my house to look after my daughter. Off they went. 7am – phone call from my best friend to say good morning to my daughter. She was handling the surprise of waking up to Aunty very well. The promise of croissants in the kitchen got her out of bed. 10am – up to antenatal ward now that the red blood had stopped. But the cannula remained in my arm until I was discharged, just in case. 3pm – I finally got to speak to my husband. He was calm, way too calm. 6pm – I got to see Legoman. The next 24 hours involved lots of visitors, waiting, Pad checks (those poor nurses) and nervous exhaustion. I also had to call my work and tell them I wouldn’t be in as I was in hospital. I was discharged home once the brown spotting had stopped and a more thorough ultrasound showed baby was fine and my placenta was still too low. The cannula came out (thank goodness) and I was put on “pelvic rest”. Which basically means nothing goes in. A friend at work thinks this is a brilliant idea and wishes someone would issue her a medical certificate that she can show her husband! I got through the first bleed. And now I wait for a second one. No one can tell me what the chances are that I will get a second bleed. No one can tell me if my placenta will move enough to avoid a c-section. All I keep hearing is “Every placenta previa is different”. Helpful. Hearing the stories of other women in a similar situation has been amazing support. I have joined a couple of Facebook groups and a forum where women support each other through these exhausting, emotional pregnancies. There is so much power in sharing our stories. One common thread is we are all hopeful. Hopeful to reach close to our due dates. Hopeful for no more bleeds. Hopeful our child comes into the world in a calm way and not through an emergency. Hopeful for those very first cuddles. I would love to hear from you if you have had placenta previa or are going through a similar experience at the moment. Together we can all get through this. After my bleed I made an Emergency Phone Numbers list to stick on our fridge and to share with family and friends. I am hoping we never have to use it. You can grab a copy for yourself here. Sign up with your email to receive new posts straight to your inbox! Lots of delicious recipes, family food ideas and free printables!